On 7th March 2019, the Sanremo Symphony Orchestra gave the Italian premiere performance of Ina Boyle’s Violin Concerto, with soloist, Razvan Stoica and conducted by Maria Luisa Macellaro la Franca, at the Sanremo Ariston Theatre. Ina Boyle named number 23 on the Irish Times’ list of Outstanding Irish Women. On a tour of Ireland, one might easily ask: where are the women? There are statues to a few (we counted just five), a smattering of commemorative plaques, and the Rosie Hackett bridge in Dublin. But most of Ireland’s remarkable heroines are invisible. The first CD dedicated entirely to the orchestral music of Ina Boyle has been named ‘Disc of the Day’ by French Magazine, Artalinna. Follow the link below to read full the article by Jean-Charles Hoffelle. Ina Boyle’s choral work ‘The Guardian Angel’ taken from her collection of 15 Gaelic Hymns (1923-24) performed by The Compline Choir a St Mark’s Cathedral, Seattle, USA. The work was performed as part of a celebration mass for the Feast of St Michael and all Angels, on 30 September 2018. The mass is available to listen back via the Compline Choir’s podcast service (follow the link below). INA BOYLE is something of an enigma. Her name is unfamiliar to most music lovers, yet she was one of the most prolific and lauded of Ireland’s 20th century composers. A protegé of Ralph Vaughan Williams, she was the only female composer to have work published by the Carnegie UK Trust, a fact which made the London newspaper headlines in 1920. She was the first Irishwoman to write a symphony, a concerto and a ballet. Great strides have been made in recent years bringing her music to wider attention. Music scholars have transcribed and edited her unpublished manuscripts. Her work was a highlight of Composing the Island, the retrospective project looking back at a century of Irish music held at the National Concert Hall in 2016. Now a recording dedicated to her work and a study on her life and music from Cork University Press is shedding light on this neglected composer and prompting a revival of interest in her work. In Ina Boyle — A Composer’s Life, musicologist Ita Beausang, gives a fascinating account of an elusive and intriguing figure in Irish cultural life. A picture emerges of a gentle somewhat eccentric woman who took an unconventional path in music-a sort of musical counterpart of Molly Keane. While shy and self-effacing, Boyle was nevertheless driven and resolute in efforts to hone her craft and promote her work. Born during the Victorian era and growing up in a remote Wicklow rectory, she composed steadfastly from childhood to old age through two world wars, the 1916 Rebellion and founding of the Irish Free State amassing a large body of work, much of it never performed. Among her first mentors, Boyle had a cousin who was married to the Armagh born composer Charles Wood and he took an interest in her early work tutoring her by correspondence. Her first real success came when she entered Sligo Feis Ceoil in 1913. She entered two works and won first and second prize. The first prize was for the piece, Elegy for Cello and Orchestra. A century after it was written, a young Swiss cellist was sifting through the archives of music for cello written during the lifetime of Walton and Elgar, searching for a short piece to add to a recording of their concertos. “When I finally came across Ina Boyle’s work, I felt immediately attracted to it. I was fascinated by her story,” says Beausang. Having gained some recognition at home and in the UK, in 1922 Boyle wrote to Ralph Vaughan Williams and asked for lessons. For 16 years until the outbreak of World War, Boyle made the journey by steam ship regularly from Eniskerry to London to work on her compositions with the eminent British composer. Their correspondence detailed in the chapter ‘Lessons in London’ indicate a warm friendship between the Irish woman and RV Williams and his wife. As well as coaching her in composition, Williams gave her advice on dealing with publishers and navigating the British music world. While she had some success, the bright future predicted for her never happened. Back in Ireland, she had influential friends and supporters among the Irish scene including Brian Boydell and Aloys Fleischmann who included her work in their programmes for concerts and broadcasts on Radio Éireann. After 1950 there were few performances of her work until the BBC Ulster Orchestra programmed a couple of performances of her work with Cork violinist Catherine Leonard performing her violin concerto in 2010. Beausang details a particularly painful rejection. For her third symphony she set poems by Edith Sitwell. Unfortunately, permission was refused by the poet and the manuscript was returned unopened. It must have been infuriating for Boyle when Benjamin Britten went on to set one of Sitwell’s poems, with the poet attending the premiere. The Second World War interrupted her career. It put an end to to Boyle’s travels to London. “When the war was over she was older and the demand for her music seems to have diminished,” says Beausang. After the London years, she retreated to Bushy Park, the family home in Wicklow where she led a reclusive life, managing the homestead and caring dutifully for her father. Composer Nicola Lefanu often visited with her mother Elizabeth Maconchy, a close friend of Boyle’s. “We loved visiting Bushy Park. I remember staying there in the late 1950s and seeing the calendar on the wall was from 1933 because nothing changed in that house. It just gently subsided,” said Lefanu. Undaunted by the lack of recognition, she never stopped composing. In February 1967 weeks before she died, she wrote to her friend Elizabeth Maconchy about her excitement in setting a “most striking old ballad”. Is it time to rescue her music from oblivion? Beausang reminds us that her substantial archive awaits rediscovery and performance. An essay in the book by Seamus de Barra offers detailed analysis of the music. Perhaps Vaughan Williams’ prediction will prove to be accurate and her time finally will come. Meticulously researched, this attractive volume is a fascinating account of an extraordinary life and will be a valuable resource for any performers undertaking a revival of the work of Ina Boyle. Ina Boyle 1989-1967 A Composer’s Life, Ita Beausang and Seamus de Barra is published by Cork University Press. Two wonderful reviews of Ina Boyle's orchestral CD by the British Music Society and The Irish Catholic. "The name of the Irish composer Ina Boyle will be unknown to many until now, but there is a renewed interest in her work, stimulated by the research of Ita Beausang and Séamus de Barra. A new book on the composer by these writers has been published by Cork University, and will shortly be reviewed in a subsequent E-News. This new CD provides a wide-ranging overview of her work, and she is well served by the performers here, since the playing is assured, sensitive, committed, and very well recorded. This comment is particularly relevant as Boyle’s sound world is one of great beauty. Her orchestral technique is solid and the music’s colours are subtle and imaginative. Her Irishness is evident in a sort of post-Stanford sort of way (not that he was one of her teachers) with the contours and idioms of Irish folk music usually in the background. She is one of those composers who continued to write quite lengthy and complex music without what one would have thought was the vital stimulation of live performances. There were such. but only spasmodic and far between. For instance, there was the disappointment of the BBC rehearsing her violin concerto in 1935 but not broadcasting it. Her main teachers were C. H. Kitson and Percy Buck; Vaughan Williams gave her periodic help and advice, and approved of her music. So – what of the music? Well, it is definitely worth listening to, but no one going to claim she is a Bax or a Moeran. The main issues are that her tonal palette is a little bland, and while at any given moment in the music sounds, well, lovely, she sometimes gives the impression of not quite knowing where she is going. For instance the Violin Concerto, an elegy for her mother is deeply felt, but the two slow first movements are too similar in mood. Samuel Barber in his concerto took the same risk but his material is much stronger. The best pieces on the disc are the Symphony and the Sea Poem. The former has well contrasted movements and hangs together convincingly. The surge of the ocean and the calls of the seabirds are most evocatively caught in the Sea Poem, thought the main idea needs more variety in its treatment, and tends to outstay its welcome". This programme of music by Irish composer Ina Boyle (1889-1967), a one-time student of Vaughan Williams, collates several of her major orchestral works. The rhapsodic Violin Concerto of 1935 is in three continuous movements, and both conductor Ronald Corp and soloist Benjamin Baker interpret the music with sympathetic attention to detail, maintaining its natural ebb and flow. Boyle wrote three symphonies, and this disc presents the long overdue recording of the First Symphony, subtitled Glencree (In the Wicklow Hills), which dates from 1924-27. The young cellist Nadège Rochat gives a powerful reading of the Psalm for cello and orchestra, written in 1927, while four short but captivating orchestral pieces complete the programme – which reveals Ina Boyle as a composer of originality and invention. Musicologist Dr Ita Beausang talks to the Contemporary Music Centre's (CMC) Jonathan Grimes about Ina Boyle. 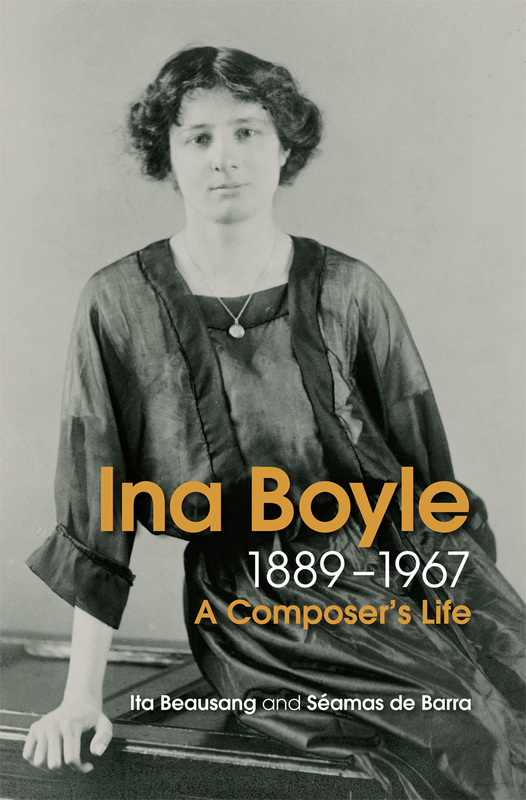 Ita Beausang and Seamas de Barra's book on Boyle's life, Ina Boyle (1889-1967): A Composer's Life, published by Cork University Press, was released this month. On the 8 March 2018, Ina Boyle's birthday and coincidentally International Women's Day, the Ina Boyle Development Committee held a special, private, preview event in the Wigmore Hall for donors to the forthcoming album of Boyle's music. This CD which is devoted entirely to the orchestral music of Ina Boyle, was recorded by the BBC Concert Orchestra, conductor Ronald Corp, and soloists Nadege Rochat (cello) and Benjamin Baker (violin). This was a very special event with excerpts from the forthcoming CD, and speakers including, Composer Nicola le Fanu who shared personal memories of the special friendship her mother, composer Elizabeth Maconchy, had with Ina Boyle. Dr Ita Beausang addressed the significance of this recording to Boyle's music, and shared some exciting information from her forthcoming book on Boyle's life, 'Ina Boyle (1889-1967): A Composer's Life '. Ronald Corp gave an account of the recording and Ina Boyle's beautiful sound world from the conductor's perspective. Nadège Rochat (cello) performing the piano and cello arrangement of Boyle's Psalm (1927), with Dearbhla Collins (piano). The orchestral arrangement of this work was recorded as part of the upcoming album. Arranged by Emma O'Keeffe. Dr Ita Beausang: Co-author of 'Ina Boyle (1889-1967): A Composer's Life'. This book is available to pre-order at Cork University Press. (Back row) Ronald Corp (conductor), Nicola le Fanu (composer), Nadège Rochat (cello), Dearbhla Collins (piano). L-R: Emma O'Keeffe, Dearbhla Collins, Dr Ita Beausang, Dr Kerry Houston. L-R: (back row) Dr Kerry Houston (DIT Conservatory of Music and Drama, member of the Ina Boyle Development Committee (IBDC)), Roy Stanley (Music Librarian, Trinity College Dublin), Dearbhla Collins (piano). (front row) Nadège Rochat (cello), Dr Ita Beausang (musicologist, author, IBDC), Kenneth Baird (Director of the European Opera Centre Liverpool, IBDC), Katie Rowan (Chair, IBDC). L-R: (back row) Dr Kerry Houston (DIT Conservatory of Music and Drama, member of the Ina Boyle Development Committee (IBDC), Emma O'Keeffe (PhD researcher, IBDC), Dearbhla Collins (piano). (front row) Nadège Rochat (cello), Dr Ita Beausang (musicologist, author, IBDC), Kenneth Baird (Director of the European Opera Centre Liverpool, IBDC), Katie Rowan (Chair IBDC). Ina Boyle (1889-1967): A Composer's Life by Ita Beausang and Seamas de Barra.